DisplayScript is a text-based programming environment. Interface elements are placed according to a textual program which appears on the left hand side of the editor. 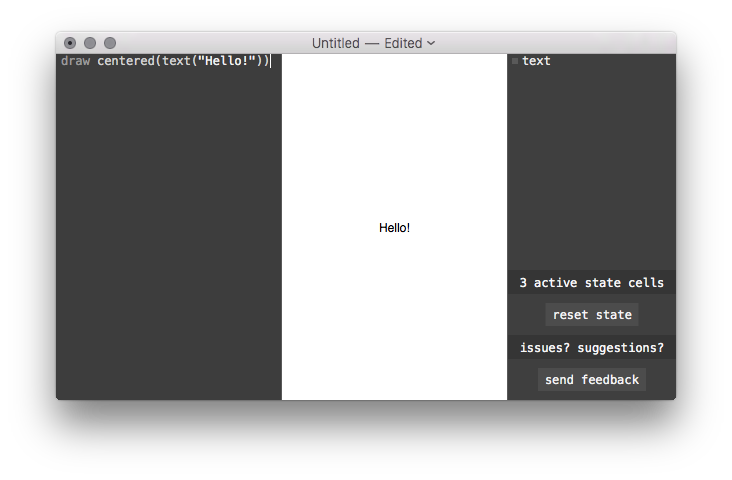 Here's a program that displays the text, "Hello!" Each of these lines is called a statement. Normally, each new line will start a new statement. Blank lines are OK: they just do nothing. See Line Breaks and Statements for the full rules about line breaks. // Center the text so it looks good. You can inspect the value of any expression using show. You can see shown values in the tree view on the right side of the editor. Using show is a great way to see what your program is doing. Check out Types of Values for all the types of values and expressions that are available. The var statement creates a named binding from a value. Using a binding in an expression will yield its value. After you've created the binding, you can assign a new value to it using an = statement. You can read more about bindings here: Bindings and Scope. See the page on Functions and Drawables for more about functions. Drawables represent interface elements. Like functions, they are a sequence of statements, but they don't take any arguments or return anything. 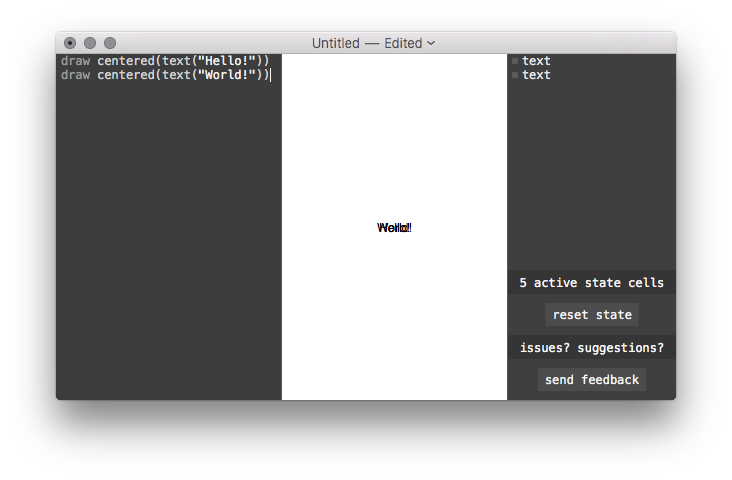 You can use draw on a drawable to run its statements. There are many other functions that take and return drawables. As we've seen, text returns a drawable that draws its argument as text (see Text Rendering for more about text). The centered function centers a drawable. You can see a full list of these drawable functions in the Drawable Function Index. You can also measure a drawable to see how big it is. Calling measure with a proposed width and height returns a record with the width and height of the drawable. The page on Measurement and Layout goes into more detail. The for statement runs the statements in braces once for each element in an array. See Control Flow for more about if, for, and the other control flow statements. When your program runs, it starts from a clean slate: all the numbers, functions, drawables, and so on are created as their statements are run. State variables let you pass values from one run to the next. Note how we use next color to update the color rather than just assigning to it directly. State variables aren't changed until the next time the code is run. Check out State and Identity for more about how state works.